Looking for a lap large enough for two! 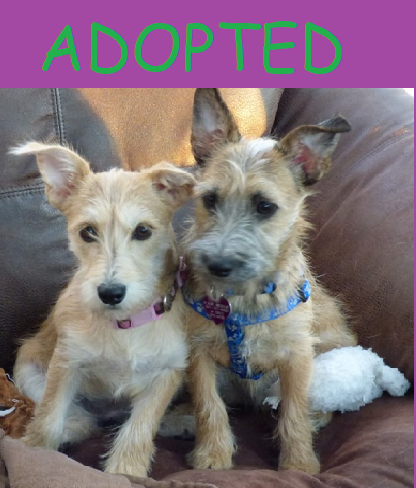 Daisy and Billy (formerly Yin and Yan) are 10 month old, petite (~15lbs) terrier mixes that were rescued as puppies from the streets of Puerto Rico. They are a bonded pair of siblings, who love human attention and a cuddly lap. Shy at first, they both have very sweet dispositions, unique personalities, and warm up quickly. Daisy is a little smaller, female, who can be more adventurous than her brother. Billy is a shy, calm male. Contact PAW to learn more about this dynamic duo!